Perhaps, you were just told that you are going to have a baby with Down syndrome. Or maybe you just received a positive result during a Down syndrome diagnostic test. What does this mean for you and your baby? Down syndrome is a common chromosomal condition that usually is expressed with physical, intellectual, and language delay. In the United States, Down syndrome occurs in 1 out of every 700 infants, with as many as 6,000 children born with Down syndrome each year. Although people with Down syndrome tend to experience some physical and mental challenges throughout their lives, recent medical advances have dramatically increased life expectancy. About 50% of people with Down syndrome will live longer than 50 years. People with Down syndrome can lead richly rewarding lives. There are more than 350,000 people living with Down syndrome in the United States. Down syndrome is a chromosomal variation resulting in 3 copies of the chromosome 21 instead of 2 copies. Down syndrome affects people of all economic, educational, cultural, ethnic and racial categories. Parent who carries a gene that produces the triple chromosome: this is an uncommon variation of Down syndrome and the least frequent. In this situation, couples who have already had a child with Down syndrome are more likely to have another child with Down syndrome. However, as stated above, this is very rare. The vast majority of couples with a Down syndrome child go on to have completely normal children. As a pregnant woman, you usually have the option to screen for Down syndrome and other fetal abnormalities at various stages during your pregnancy. Consult your doctor to discuss which follow up options are right for you when you are expecting a child with Down syndrome. See articles about prenatal screening here and here. How will having a child with Down syndrome affect my pregnancy? Expecting a baby with Down syndrome will not change your pregnancy. It will be like any other pregnancy. However, many babies with Down syndrome have heart and stomach issues, some of which can be detected prenatally. You should consult with your doctor about how they may affect your delivery and your baby’s postnatal care. What are babies with Down syndrome like? There is wide variation in mental abilities, behavior, and physical development in people with Down syndrome. Like all children, each person has his/her own unique personality, capabilities, and talents. Children with Down syndrome can and do learn. They commonly graduate from high school and often pursue other opportunities. Many adults with Down syndrome have jobs, live independently, and enjoy contributing to their communities. Some have married. Because people with Down syndrome are sterile, they do not procreate. Whether you are celebrating the birth of your child or anticipating his or her arrival, here are some resources for you to get started on the rewarding process of having a child with Down syndrome in your life. Recent advances in technology have made it increasingly possible for people with Down syndrome to thrive in society. As a parent, you should try to learn all about Down syndrome and getting the facts right so you can be as prepared as possible. Read some important facts here. Caring for a child with special needs requires a lot of organization. Keeping track of their medical records, appointments, and pharmaceutical needs can be a handful. Keep a binder of all the important information easily accessible for reference. Develop an emergency contingency plan for different scenarios, and have a back up plan for when things don’t go the way they were supposed to. There are many medical professionals and aid workers who specialize in supporting children with Down syndrome. These include therapists, special educators, personal support workers, and other professionals. Gathering a group of quality people will make caring for your child easier, and even provides options for others to care for your child in your absence. Getting in touch with other parents and families raising kids with Down syndrome will provide you with a support network that will be crucial down the line. Many major national organizations provide support to parents through information and conferences, and it is easy to get involved. Your child will eventually also benefit from social interactions with people who have the same values and outlook on life. You can also find local groups in your area, and connect with other parents who have similar experiences. The early development of every baby is filled with milestones and learning, and it is not any different for babies with Down syndrome. Your role as a parent does not change whether or not your child has a disability, and you have the opportunity and responsibility to influence their development from an early age. 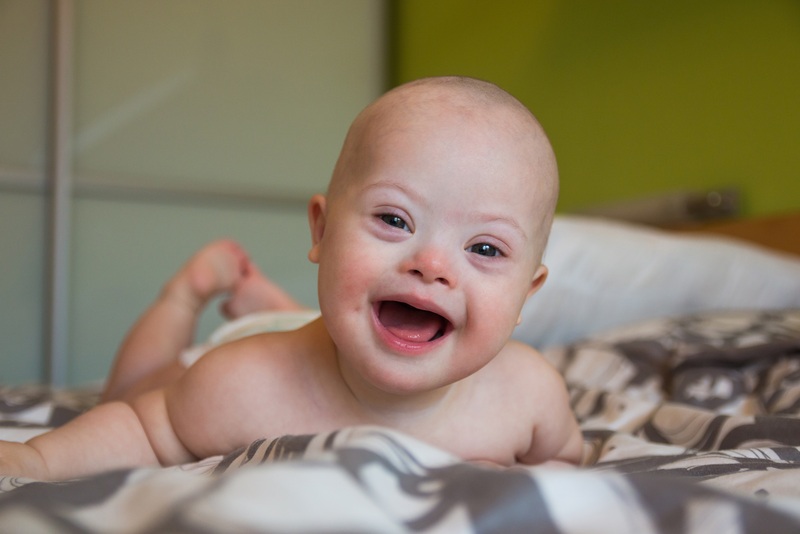 Babies with Down syndrome benefit from loving homes, proper education, diligent medical care, and positive communities. With the proper nurture, kids with Down syndrome flourish in their environments. Remember, being a parent is challenging, regardless of the capabilities of the child. It is important to surround yourself with a like-minded community, and use all the resources at your disposal. Do you want to be screened for Down syndrome? Jenny Cai has a Master's degree in Experimental Medicine. She currently works as a medical writer and editor, and has a background in developmental neurobiology. She likes blogging about current science topics and health issues, especially childhood development. When she's not writing, she likes practicing Brazilian Jiu Jitsu, long distance hiking, and playing with her 2-year old daughter.